"One time I had a friend come to our house, and, at one point, she started laughing. When I asked her why, she said, 'It's so funny that there is always somebody singing in your house. I've never experienced anything like that.' We never really put together the fact that we were always singing. It was something that was just natural and organic for us," remembers Matthew Cook. "That's when I actually realized that one of us was always singing around the house." Matthew is the musical architect and lyricist of the Ceremonies, a band that includes his two younger siblings, fraternal twins Mark and Michael. From a young age, their lives have been filled with art of all kinds – music, film, literature, painting – so it didn't come as a huge surprise when the trio selected the Museum of Contemporary Art (MOCA) as the location for us to discuss growing up in the San Fernando Valley, their debut self-titled EP that released in October and art, of course. The native Angelenos would often come to MOCA for high school field trips and continued to visit the museum as their love for visual arts intensified and Matthew and Michael enrolled at USC's School of Fine Arts. Although Mark chose to major in business administration, he is equally enamored with the arts. "He's always simultaneously done art with us," says Matthew. "I went to the fine arts school of Michael and Matthew," Mark jokes, as we walk into the first room with pieces from MOCA's current Room to Live exhibit. Matthew spies Cosima von Bonin's Untitled (Bikini Loop #1), a gigantic navy blue and white bikini hanging in a doorway, and immediately exclaims, "Oh no, they stole my bathing suit!" After our chuckling dies down, I ask if they are still able to visit MOCA as often as they would like even though they're on sabbatical from school to tour and pursue their musical aspirations. "We try to come often," Michael admits. "The last exhibit I came to was Art in the Streets, the graffiti exhibit, and I actually went and saw it four times." "I check their website all the time to see what's on display. We're most interested in conceptual art, and that's the primary difference between the Museum of Modern Art (MoMA) and MOCA. There's much more conceptuality here," describes Matthew. "Part of the reason why we instantly thought of going here was it's inspirational to look at other people's work, and some of the best ideas are spurred from admiring others' ideas. It might spark something that's related or unrelated, that's different enough to be a separate entity in itself. In that sense, MOCA's a harbor of inspirational creativity." We explore more of the Room to Live exhibit, including Samara Golden's video and sound installation The Fire Place, a white, yellow and orange light installation by Mark Handforth entitled Desert Sun and Rodney McMillian's huge Representation of a Landscape as a Wall piece, while Michael names some of his influences as an abstract painter. He mentions Paul Cézanne, Pablo Picasso, Joan Miró and Jasper Johns, then adds Banksy's stenciling work as a more recent inspiration. "What's interesting about contemporary art now is that people work in all mediums, and we're particularly interested in not being so pigeonholed by the notion of being a band. We also like to make paintings as a collective, as well as films or other media," Matthew remarks when I ask about particular field of interest. "In art school, I tried to do the same. When I was taking art film classes I would make the scores for the pieces, so they became more than film pieces. They had music and poetry, multiple mediums." The ability to mix various media together is something that sprouts from the Cooks dabbling in several different forms of art since childhood. They all started with piano lessons and experimented with a drum set that was in their house, then Matthew begin playing the violin in fourth grade and played in the orchestra until his senior year of high school. He played stand-up bass in a jazz band, guitar in several other bands and sang in an a cappella group. Mark picked up alto sax, and Michael learned tenor sax before both switched to choir, a cappella groups and musical theater. "It was musical chairs with instruments," Mark offers. "Michael and I were also into sports. Matt would come to a lot of our games, and the car rides over were always filled with music. Even though we were going to a sports game, we were singing in the car. We were always singing together. Our old choir teacher would do one-on-one lessons at our house, and when he would be teaching one of us during a lesson, another one would be singing from his bedroom. The teacher would always laugh during the lesson because we'd be singing the same song." When I ask which artist they would mostly sing along to with in car, all three of them instantly respond with "Michael Jackson." "He's a huge influence for us. There's a photo of all of us wearing his classic hat with our fingers taped up like his," Michael recalls with a laugh. "I also remember both of our parents being into the Beach Boys and the Beatles. We would sing along to their albums a lot on the way to baseball games." With the Beach Boys and Beatles as some of their first examples, in addition to a cappella and musical theater training, it's no wonder that the Ceremonies' songs boast some amazing harmonies. As the boys began developing their own musical taste, they started listening to groups like Echo and the Bunnymen, the Cure, Joy Division and the Bee Gees. They also started branching out into other art forms. In high school, I was into web design and graphic design. For me, it was always design, drawing, poetry and music. Ever since I was 12, writing poetry and lyrics was my cup of tea or my coffee, rather, because it's an addiction," Matthew confesses. "I grew up going to this place called Unknown Theater. I played some shows there in bands. There is also this thing called the Two Dollar Shows that one of my peers, Spencer Ludwig, started in high school, and it became a big communal thing. HAIM played there, and Spencer's now a member of Capital Cities. That was the music scene that I was a part of, I guess, if you could call it a scene." Matthew played in several bands with other people but eventually formed the Ceremonies with Mark and Michael two years ago. "I had a bunch of songs done that I didn't really have any plans with, and I showed them to Michael and Mark. What I was writing was so harmony driven and we were always singing together, but it sort of never occurred to us that we should be doing something together until we started doing acoustic gigs for fun, just covering songs, and people would come up to us and say, 'You guys should really start a band,'" Michael remembers. "I was always in the headspace of my being in my own bands, and [Mark and Michael] were sort of extras. I would be playing with my band, and the drummer wouldn't show up so Mark would fill in." "I was the understudy," interjects Mark. "Exactly, and eventually when that [other band[ fell through, it was pretty obvious we should form one together," finishes Matthew, as we come across Marnie Weber's Giggle of Clowns installation, a room filled with clown statues assembled around a prone body covered in flowers. "Now, this is cool," Matthew comments. "I'm not afraid of clowns, but I'm sure a lot of people would be scared." In fact, Mark and I do get a little freaked out when speakers hidden behind the figures let out a demented laugh. We compose ourselves and head into an installation from one of the Cooks' favorite artists, Ryan Trecartin. A room is filled with pieces of furniture to sit on, don a pair of headphones to listen to the soundtrack and view movies by Trecartin. "We are big fans of Ryan Trecartin, so we're excited to see this," Matthew gushes. "He's almost like a psychedelic video artist. It's cool because he does mixed media, he built all of these prop pieces, and his video pieces are super disorienting. It's like being in your subconscious." "His videos seem like they look like what Animal Collective's sound is," offers Mark. "It's exactly how you would imagine Animal Collective to sound like visually." Film is a medium that the brothers, Matthew especially, have really started to explore since beginning art school. David Lynch and Richard Linklater are two filmmakers that he admires. His passion is evident as he describes Linklater's most recent film, Boyhood, in which the writer/director explores the course of one boy's life over a 12-year period. Matthew feels that Boyhood definitely relates to the childhood theme that is evident in many of the Ceremonies' songs. The idea of returning to the innocence of childhood is definitely a concept behind the band and was in their minds as they turned to the works of several artists that they admire when trying to come up with a name for their group. "The Giver was one of them. Lois Lowry talks about the ceremonies that they have, and the Ceremonies of Three in particular were important to us. Obviously because of the number, but conceptually it was most aligned, coincidentally, with our purpose: capturing that childhood innocence and restoring it in people that have lost it," says Matthew. "In the book, the Ceremony of Three is when kids begin to start telling their dreams and start to calculate what has happened in their dreams. "We also wanted to pay homage to the Joy Division song 'Ceremony,'" adds Michael. "And, all of our initials are 'M.C.,' which stands for Master of Ceremonies, so it fit well," says Mark. "I was reading a lot of poetry and books by Ram Dass and Timothy Leary, 1960s psychedelic culture, that referenced the acts of ceremonies because they're so important in Native American culture and this communal bonding that people in Western society lack a lot of the time because we're all in our own pathways. That's essentially what we would like to cater to with our concerts, that feeling of ceremony," Matthew ponders. "You don't have to go to a wedding or technical ceremony to share that communal bond with people. It's more of a togetherness and sense of shared artistic integrity." Inspiring creativity through a return to childhood innocence is an idea sprinkled throughout The Ceremonies EP, and is felt most strongly in its first single, "Land of Gathering," which is also featured in a Fab.com ad. The brothers were able to exercise several of their artistic abilities in the creation of the track's video, which garnered them attention as an MTV Artist to Watch. "We did a lot of the editing ourselves," says Michael. "We drew and painted some of the animation, so we were really involved creatively." Matthew adds, "We were so stoked to work with animator Phil Nibbelink because he worked on films for Disney like Who Framed Roger Rabbit?—"
"The Fox and the Hound and The Black Cauldron," Mark chimes in. "Everything that served as a beacon for our nostalgia." While attending USC, the Cooks lived in Downtown and often passed by an L.A. landmark that also brought them back to their early adolescence, the Walt Disney Concert Hall, where they took part in various performing arts competitions and even had their graduation ceremonies growing up. Aside from MOCA, they would also visit REDCAT (Roy and Edna Disney/Cal Arts Theater) for various art exhibits. Although they've moved back to the Valley, they have several favorite spots to hang out at throughout the city. "You know where we've been shopping lately is AllSaints because we were one of their featured artists," says Matthew. "We really appreciate them because they support indie artists and a lot of new bands." The trio often eats at Tender Greens, Mendocino Farms and Il Tramezzino. "We really like Blue Dog. We love burgers, and they make really mean burgers. It's like a tavern and has pictures of people's dogs everywhere. We're dog lovers, so it's nice," Mark says, before informing me that they just got two Siberian Husky puppies. "We want to become vegetarians at some point, but it's hard on the road because nothing's open after a show." "I don't get why there aren't more healthy places open late at night," adds Matthew. "Seriously, business would boom." Aside from the lack of healthy food options on the road and their new puppies, the Ceremonies are going miss one important part of life in Los Angeles as they embark on a North American tour with Glasvegas, the weather. "This is a bizarre place, seasonally," says Matthew. "The fact that it's an escape from normalcy; everywhere else there's seasons, and we just have warm or not as warm." "It's almost like a drug, everybody's happy and sunny every day," Michael laughs. We finish up our tour of the museum, and the brothers continue to laugh with one another when I ask if there are any interesting facts they would like to share about each member of the trio. Matthew and Mark easily admit to being huge anime fans, especially of films by Hayao Miyazaki. Matthew can also perform an unusual trick of bending his pinky in a perfect right angle, but when it comes to Michael they have a tough time coming up with something. "I guess he's just not that interesting," Matthew jokes. "I tried making my own clothes once. I made a leather vest," Michael offers. "And there was a period of a month where we all got into archery." "Our dad set up an entire range in our backyard," Mark remembers with a smile. "He bought a big styrofoam block and put a target on it." "What we're trying to say is that we tried to be Legolas from Lord of the Rings," Matthew laughs. There is an undeniable chemistry between the three Ceremonies that just can't be attributed to their being brothers. It's born from the fact that they all genuinely love being around each other because they share so many of the same interests. "Being related helps in small bits, like maybe our vibrato speeds – small technical things – but the fact that we get along well isn't because we're brothers, it's because we have a passion for the same things," Mark says. "It's just a human connection. It's probably easier to get along because we grew up so similarly, have very similar senses of humor and taste in art, especially music," sums up Matthew. "It goes to prove that you're made of what you surround yourself with." The Ceremonies EP is currently available. 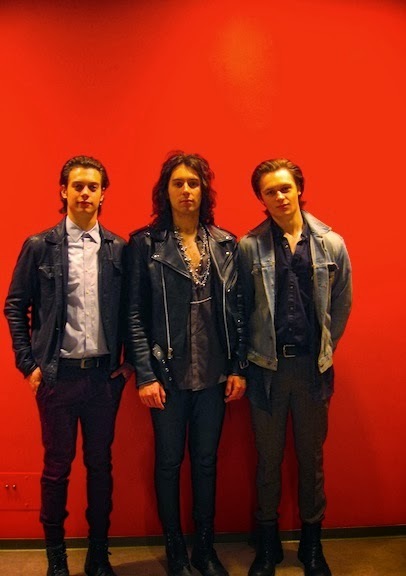 The Ceremonies perform March 4 at the Echo. For more information, visit theceremonies.com.